Far too many organizations are simply operating without visibility to what's actually happening throughout the supply chain. In this state, businesses decisions are often made based on a myopic, single-process view of the operation vs. what's best to maximize customer value at the lowest possible total cost. In a recent benchmarking Quick Study, we surveyed C-Suite and VP-level executives from manufacturing, retail, wholesale, and service companies to understand where they have (or lack) end-to-end supply chain visibility. We shared the results in our recent webinar on "Creating End-to-End Visibility in Your Supply Chain" presented by Derek Browning, VP of Sales and Marketing and Brent Rogers, Director of Lean Deployment for LeanCor Consulting. Overall, the survey results were overwhelmingly positive. DEREK: "Product concept to delivery lead-time is lagging – will this be a problem for organizations moving forward?" BRENT: "I would call it the 'next-frontier.' Educating our product development and sales and marketing groups on supply-chain activities, and aligning better coordination between the two will help us be more responsive to supply-chain demands. DEREK: "We see high levels of visibility and action on On-Time, In-Full (OTIF) metrics – does this match what you see in LeanCor Consulting projects?" BRENT: "To a degree, I think there are gaps in how information is dissiminated, how real-time that information is, and what actions are actually driven by it. But the percentages themselves do not surprise me." DEREK: "There seems to be some neglect around inbound logistics performance. Is this common in your projects?" BRENT: "Yes, organizations often try to lump supplier performance together with inbound logistics, assuming it will be taken care of. This results in the need for more inventory and effort through the supply-chain, as there hasn’t been a recognition of quality at the source in the inbound supply chain." DEREK: "Overall we see strong indicators that organizations are managing financial metrics from a from a visibility standpoint, and it’s driving action, yet total network cost, or total cost of fulfullment, seems disproportionate. What does this mean?" BRENT: "40% admitted they do not have visibility to this. But in our actual experience, it’s more like 80% do not have visibility. Clients are often surprised when we often find hidden costs they didn’t know about." 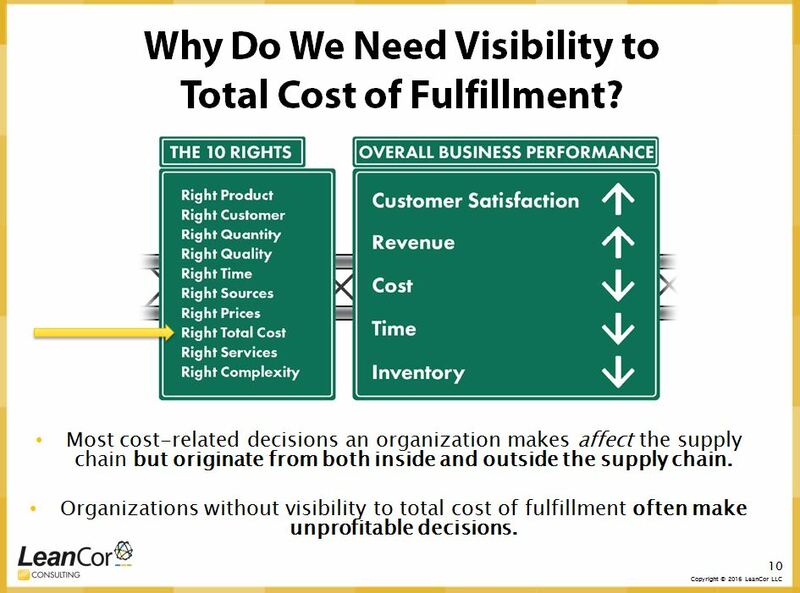 Why do we need visibility to total cost of fulfillment? Total cost is defined as the system wide, long term total cost of a decision. Overall business performance is essentially a reflection of supply-chain performance. Revenues are achieved or lost by supply-chain performance, and profit is a result of the corresponding costs of the supply chain. The right total cost is of one of the "10 rights," or supply chain performance indicators. If a process underperforms relative to one of these 10 rights, it needs to be fixed. If a process doesn’t support any of these 10 rights, it begs the question, "why are we doing it?" Or, contact us for your own supply chain assessment.